After all, profit is why we are here and so by using our newly released September Tipster Profit Report, we can help answer this once and for all. To calculate the answer, we took the top 15 tipsters we monitor on any sport and listed them by the annualised growth they make in an average year. 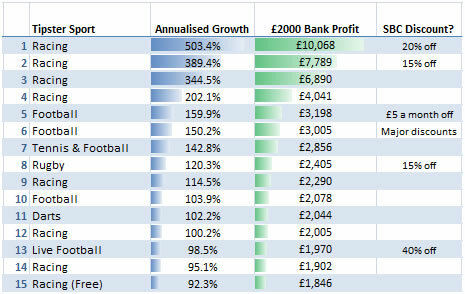 Simply put, this figure shows how much your betting bank will grow over a standard 12 months. We calculate this in 2 ways – first as a percentage, so 100% growth means you effectively double your starting funds. Secondly, we then translate that into financial sums based on the profit from a £2000 bank. The results highlighted in the table below are like ‘gold dust’ for any punter wanting to maximise profits. Please note: Full tipster identities are open to SBC members only. So join today and also take advantage of our exclusive discounts on all the top tipsters. There are some very impressive figures to hand with the first 3 Racing tipsters enjoying exceptional form long-term results with 344%, 389% and 503% returns respectively. The Football guys are not far behind with the best making between 142% and 159%, whilst Rugby and Darts show up well with 120% and 102% between them. It’s fair to say that anything over 100% growth is phenomenal, especially when you consider some of these tipsters have been doing this for years! All told, the worst annual profit from our top 15 tipsters is 92.3% – and that from one of the free racing tipsters we monitor. So…Whats The Best Sport To Bet On? From the top 15 tipster table above, its fairly clear that Racing services lead the way from our top 15 monitored services, but what results do we get if we add in the other 30 tipsters that we monitor? Once again Horse Racing is undoubtedly the best sport to bet on to maximise your profits, although this figure is increased by the top 3 Racing tipsters on our books – all of whom have exceptional returns. In contrast Football tipsters, although unlikely to grow your bank 4 to 5 times over in one year, do remain very consistent and are often considered a lot easier to follow. The other tipsters, which include Darts, Rugby & Tennis experts also do very well with an average profit of £1,898 to showcase why niche sports can also pay off. The tables above are taken from September’s new Tipster Profit Report, which features all the latest results, best-buy tables and commentary on 45 of the best tipsters that we proof and monitor. Through this you can also find out details of those we rank in our Hall of Fame – those services we rate the highest and proven to make you money. You can also gain full access to our SBC Discount Club, where you can make substantial discounts off the cost of many tipsters. If you are interested in tipsters – let us do the hard work for you and show you just which ones you should be following (and those to avoid!). This entry was posted in Tipsters and tagged football, Horse racing, tipster tables, tipsters. Bookmark the permalink.